Lava from the Kilauea volcano that flowed into Kapoho Bay has created nearly a mile of new land and officials with the US Geological Survey said Thursday the flow is still very active and there's no way to know when the eruption will end or if more lava-spewing vents will open. The fast-moving lava poured into the low-laying coastal Hawaii neighbourhoods in just two days this week, destroying hundreds of homes. As the lava marched toward the bay, it vaporised Hawaii's largest freshwater lake, which was hundreds of feet deep in some places. The new land in Kapoho Bay is now owned by the state, but the peninsula won't look like the farmland that dominates that region of the Big Island anytime soon. This 6 June 2018 photo from the US Geological Survey shows Kilauea`s lower East Rift Zone, showing continued fountaining of a fissure and the lava flow channel fed by it near the town of Kapoho on the island of Hawaii. Photo: APDepending on climate, rainfall and other variables, new vegetation could start growing soon, but it would take much longer for the fertile land and lush rainforests to build back up. "How soon vegetation comes back on a lava flow really depends on the type of lava it is, and how much rainfall there is in the area," said Babb. "There are flows on the Kona side of the island that are much older than some flows on east Hawaii, they are much older but they have far less vegetation and that's just a reflection of the difference in rainfall." This 6 June 2018 photo from the US Geological Survey shows a fish-eye view of a lava delta filling the former Kapoho Bay at the town of Kapoho on the island of Hawaii. Photo: AP"A lot of the ocean entries are extraordinarily unstable," Ferracane said. "The bench that was formed during 2016 and 2017 61G flow has already collapsed and fallen into the ocean, so nobody really owns that any longer." The lava, which has covered more than 5,000 acres (2023.47 hectares) in this latest eruption is not only expansive, but very thick. 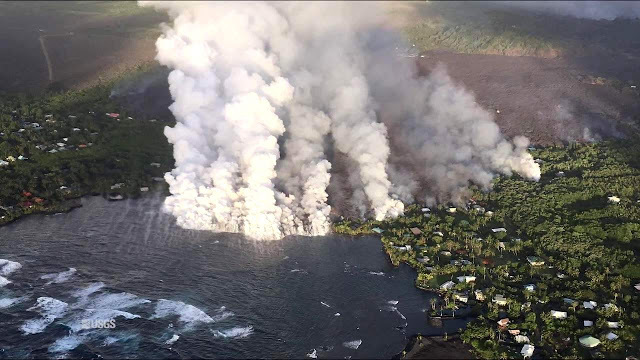 Scientists said that while the height of the lava is variable depending on the source and local topography, much of the area is covered in 10 to 20 feet (3 to 6 meters) of lava. There are no homes left in the Vacationland subdivision and neighbouring Kapoho has only a few homes left standing. They too are cut off and inaccessible.